Skills formation plays a key role in the European EU2020 growth strategy. Skills, however, do not develop overnight: skills development takes time. It also requires workplaces affording learning opportunities and workers readily capitalising on the available learning opportunities. A long and respected research tradition has acknowledged that workers learn on their job and that they become increasingly skilled with tenure. This ‘learning curve’ underpins productivity increases in production lines over time . The same positive relation between skills development among adult workers and an individual’s years in a job has been found in the European skills and jobs (ESJ) survey. 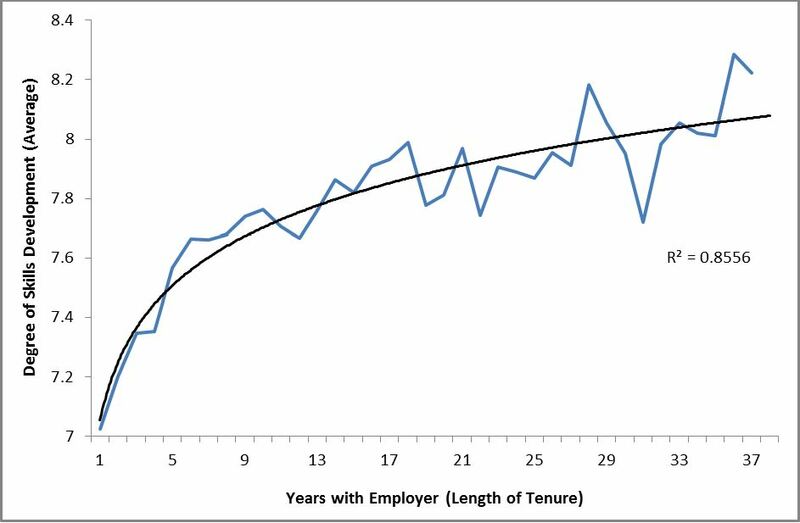 The precise shape of this learning curve is shown in Figure 1, which shows the average degree of skill development for workers according to years of service with the current employer (employer tenure). It is evident that employees recently joining an organisation experience a faster pace of skills development than the one experienced by workers who have been longer in their organisation. The ESJ survey also shows that the period over which workers experience skills development is long: skills development is still positive after 15–20 years with the same employer. After this period the relationship becomes increasingly erratic, but the upward trend is still clearly visible. All in all, skills develop over a long period of time, albeit at a decreasing pace. The strong and clear relationship between job stability and skills development holds in every EU country. Fostering skills accumulation via job stability is a matter of having in place the right employment incentives. Employees need to perceive that employers are not too focused on short run productivity gains; employers must have some trust that their workers will not leave after they have invested in their skills development. For instance, HR practices having a positive impact on job satisfaction – such us job enrichment, job rotation, flexible working times, the available vertical and horizontal communication channels – can support employment stability and foster skills development. NB: Skills development is measured on a 0 to 10 scale whereby 0 denotes ‘decreased a lot’, 5 ‘remained the same’ and 10 denotes ‘increased a lot’ since the time an employee started his/her job with his/her current employer. Source: Cedefop European skills and jobs (ESJ) survey. This is not the end of the story. Learning and developing one’s skills requires effort and is tantamount to an investment. Workers bring knowledge, skills and competences but also attitudes to the workplace. Workers’ readiness to develop their skills can be captured by their attitude towards learning; those with a positive attitude to learning will engage naturally and more frequently in learning activities than workers with a poor attitude. 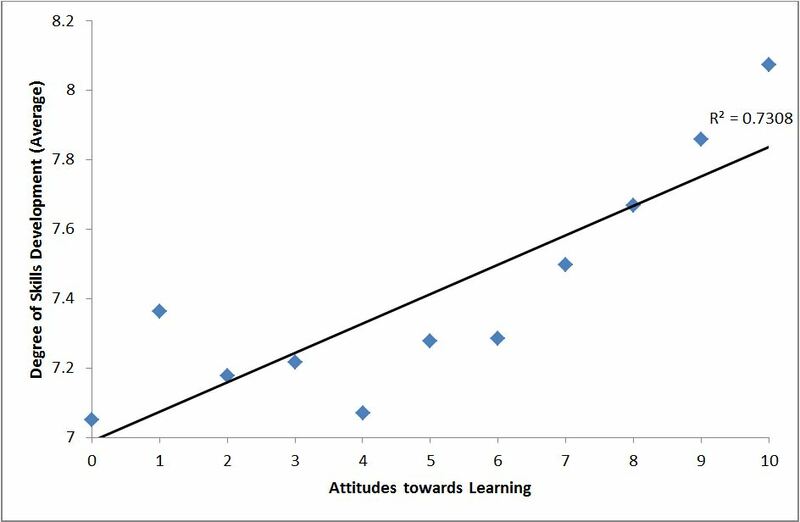 The positive relationship between the attitude towards learning and skills development is shown in Figure 2 . 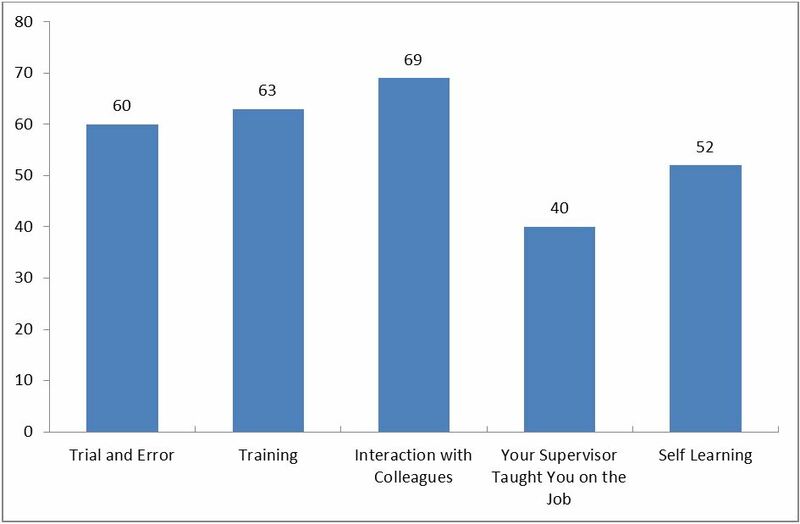 In general all workers experience a skills development, even those with a poor attitude to learning (scoring 5 or below in the X axis in Figure 2). An increasingly positive attitude towards learning is associated with an increase in the average degree of skills development. The upward sloping part of the curve suggests that the attitude of workers toward learning matter for skills development. NB: Skills sevelopment is measured on a 0 to 10 scale, where 0 denotes ‘decreased a lot’ 5 ‘remained the same’ and 10 denotes ‘increased a lot’ since the time an employee started his/her job with his/her current employer. Attitude towards learning is captured by the level of agreement with the statement ‘I enjoy learning for its own sake’ measured on a 0 to 10 scale, where 0 denotes ‘totally disagree’ and 10 denotes ‘totally agree’. Organisations need to support workers’ learning. This means not only training. Organisations can provide learning opportunities in the form of complex job design – job designed to challenge workers and to push them outside their professional comfort zone – thus inducing learning and skills development in the process . The fact that even workers with a poor attitude to learning develop skills, see Figure 2, is an indication of how important workplaces are for skills development. 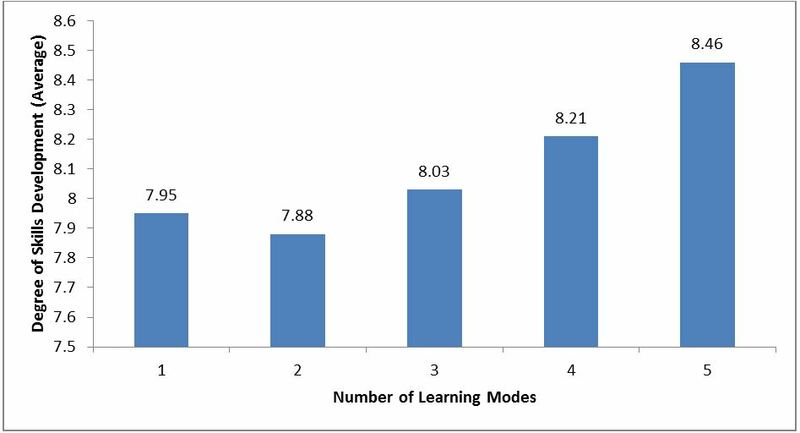 The ESJ Survey gives a snapshot of the most prominent learning modes through which workers develop their skills, shown in Figure 3. Formal training is a frequent mode of learning, but an even more important one is interaction with colleagues. Autonomous learning through trial and error is also a commonly used learning strategy, as is self-learning aided by learning resources (books, manuals, the internet, etc.). NB: Frequencies amount to more than 100% because multiple answers were admissible. If learning is to be based on trial and error or on personal initiative, workers need to be given the autonomy to try various solutions and organisations need to provide necessary space and leniency for workers to make mistakes. Organisations can also influence the amount of non-tangible resources provided for learning by encouraging peer learning or allowing adequate time for supervisors to interact with and tutor employees. The importance of the availability of organisational resources for skills development is highlighted in Figure 4, which shows that the number of learning opportunities is positively linked to stronger skills development. In other words, workers who could take advantage of multiple means of skills development (e.g. training courses, on the job training, supervisory support, peer learning) since the time they began their job experienced a higher degree of skill formation, relative to those who could benefit from fewer learning modes. NB: Skills development is measured on a 0 to 10 scale, where 0 denotes ‘decreased a lot’ 5 ‘remained the same’ and 10 denotes ‘increased a lot’ since the time an employee started his/her job with his/her current employer. Organisations are extremely important loci of learning and skills development. A stable work environment is a crucial ingredient for skills development as it gives workers and employers the long-term perspective needed to invest in education and training activities. Work incentives aimed at increasing job satisfaction can be used to stabilise the employment relationship. However, additional factors need to be in place to fuel the investment in skills. Workers’ readiness in engaging in learning activities and in drawing on and investing in their skills varies. To encourage workers investing in their skills and deploying them at work, also among those workers with a poor attitude to learning, organisations need to offer varied learning opportunities together with challenging jobs, space for autonomy, and training. Organisations can also support skills development by encouraging peer learning among co-workers. When organisations match workers’ knowledge, skills, competences and attitudes with learning opportunities and challenging jobs in stable work environments, that’s when skills development ensues. Anzai, Y.; Simon, H. A. (1979). The theory of learning by doing. Psychological review, pp. 124-140. Arrow, K. J. (1962). The economic consequences of learning by doing. The review of economic studies, Vol. 29, No 3, pp. 155 - 173. Bessen, J. (2015). Learning by doing. The real connection between innovation, wages, and wealth. New Heaven: Yale University Press. Epple, D.; Argote, L.; Devadas, R. (1991). Organisational learning curves: a method for investigating intra-plant transfer of knowledge acquired through learning by doing. Organization science, Vol. 2, No 1, pp. 58-70. Klenow, P. J. (1998). Learning curves and the cyclical behaviour of manufacturing industries. Review of Economic Dynamics, Vol. 1, No 2, pp. 531-550. Levitt, S. D.; List, J. A.; Syverson, C. (2013). Toward an understanding of learning by doing: evidence from an automobile assembly plant. Journal of political economy, Vol. 121, No 4, pp. 643-681. Discover more #ESJsurvey indicators and analysis at the Skills Panorama! Arrow (1962); Anzai and Simon (1979); Epple et al. (1991); Klenow (1998); Levitt et al. (2013); Bessen (2015). The degree of skills development displayed at low level of attitudes towards learning (0 on the X axis in Figure 3) does not include Lithuania because of an unusually high level of skills development in this country. Including Lithuania the average degree of skills development jumps to 7.54 when the attitude towards learning is 0, suggesting a U shaped relation that might be spurious. Read more about #ESJsurvey INSIGHTS No 5 - A 'New skills agenda for Europe': What are the key challenges? #ESJsurvey INSIGHTS No 5 - A 'New skills agenda for Europe': What are the key challenges? Read more about #ESJsurvey INSIGHTS No 6 - Tools for a new #EUSkillsAgenda: a tale of synergy or isolation? #ESJsurvey INSIGHTS No 6 - Tools for a new #EUSkillsAgenda: a tale of synergy or isolation? Read more about #ESJsurvey INSIGHTS No 7 - EU workforce: overeducated yet underskilled? #ESJsurvey INSIGHTS No 7 - EU workforce: overeducated yet underskilled?